Wow! very nice wall! I love the colours and the effects! i love that moon it so bright and she evn looks cute,even know i cant c her face any way great job,oh!dont worry my englihs is worse then urs way worse. Very well done. I think a more darker color would have been better for this, to give it a better sense of lonliness and mystery, but I still like it. Still has that classic abstractness. Great job as always! I love the overall effects. Though the moons look too 2-Dish. Nice work! 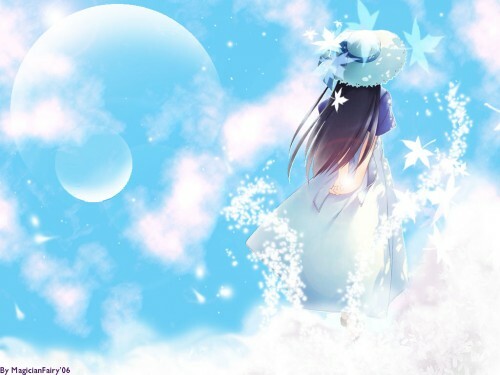 what a charming looking background you managed to create Olga-Chan :) I really like it! and the planets you added are matching so well with the environment! I'll add it to my favorites! This is a very beautiful wallpaper Magicianfairy senpai. It's brilliant in color. Although bright, you still manage to give the tone of loneliness in the picture. i must say you're very skilled at making backgrounds. the colors are just awesome. Wow! Your walli is really pretty! The colours and the moon are really cute! Nice ! Beautiful wallaper ^ ^ . Thnak for sharing. Goodness Fairy! The words you say always crack me up. I ~luv~ your English! It takes a while to get photoshop under your belt and goodness, indeed, you are sooooo improving with your walls and learning how to wall. This wall is very nice and romantic too . . . it has a very good mood . . . i like it very much.